In stock -This product will ship today if ordered within the next 10 hours and 48 minutes. 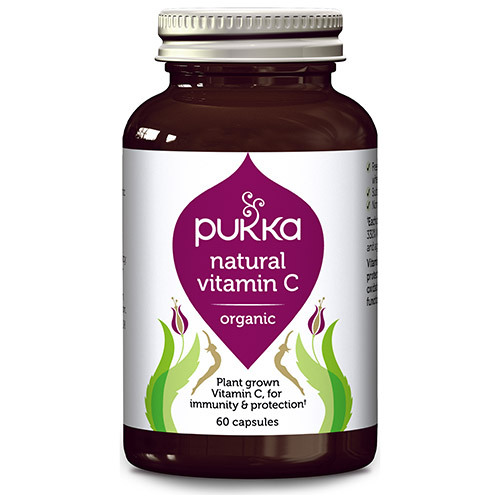 Pukka Organic Natural Vitamin C is 100% naturally derived from a blend of organic fruits that delivers a potent synergistic concentrate of Vitamin C, just as nature intended. This broad-spectrum formula contains the highest organic grade, sustainably cultivated fruits and herbs, carefully selected to bring you the full potential of nature’s goodness. One of the many gifts of Vitamin C is that it helps support your immune system. Pukka Organic Natural Vitamin C provides a healthy support for the immune system, perfect for the whole family. Acerola fruit concentrate* 50%, Amla fruit concentrate (Orgen-C™) 19%*, Amla fruit powder 14%*, Rosehip* 6%, Whole lemon fruit*, Amla fruit juice freeze dried crystals 3%*, Black Pepper*, Bilberry fruit fresh freeze dried*, Vegetable cellulose capsule (hypromellose). Take 2 vegicaps a day with water or Pukka organic Aloe Vera Juice before food. Below are reviews of Pukka Organic Natural Vitamin C - 60 Vegicaps by bodykind customers. If you have tried this product we'd love to hear what you think so please leave a review. Hopefully it is helping! So far I haven’t had any colds and flu viruses and I certainly don’t have any vaccinations! No colds for 2 years since taking natural vitamin c rather than man made vitamin c. This product really works and I highly recommend it. Gentle on the stomach too. I can honestly say this is the best vitamin C i have used, and i have tried many over the years. So pleased i found a natural one. The synthetic ones are a waste of time. The best vitamin C I've used. I've fought off man colds with this vitamin C by taking it as soon as I fee a bit ill or have tickle in my throat. I didn't notice a difference with any other vitamin C I've tried. Maybe that's the difference between naturally supplied biodynamic vitamin C and others which are often synthetic. I also love it for adrenal support. I like these capsules as they are made from organic living things, rather than synthetic chemicals. They are slightly large which I don't find a problem to swallow, but someone who has trouble swallowing may struggle with these.